© 2015 Stephen James. All Rights Reserved. 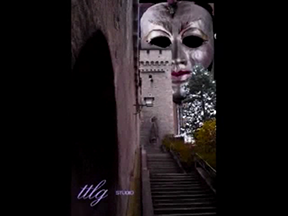 Abstract video of decorative masks and lifelike figures in surreal settings accompany an in-depth literary/psychological analysis of Lewis Carroll’s Alice’s Adventures in Wonderland and, particularly, its sequel, Through the Looking-Glass. The video is introduced and concluded by a view into and out of “infinite mirrors” — transporting the viewer into and out of artist Stephen James’ TTLG Studio.